I grew up being an outspoken person. The only moment I ever feel shy is in front of a man that I deeply love. Other than that, scrap shyness from my dictionary. I'm that girl that would walk up to anyone I admire and speak to them if I wanted to. Well, so long as there's no "unnecessary protocol" officer obstructing my way. Not everyone is like me- Princess the extrovert. You probably fall in the category of the blessed introverts who need some extra push before they can approach someone. It's okay. We are having this lesson to show you how to go past the "secret fear of rejection" towards fulfilling relationships. Networking goes beyond meeting people or walking up to them. Meeting and approaching them is only the first step on the path of building fulfilling relationships. Networking is an art. A fine art that must be learnt, imbibed and wielded for effective results. 1. COMMON INTEREST: Effective networking requires a common interest between the parties. Please note that common interest doesn't mean that you and they must be in the same organization, do the same things, be on the same level/social status or know the same people. If you limit yourself to the above, you will never have a rich network. That people attended the same event as you, doesn't make them have the same interest with you. Common interest may not be readily obvious. You might need to ask questions to help you decide if you both have the same interest. 2. DEFINED GOALS: Before you can effectively connect with people, you must first know where you are going and what you can possibly expect from a relationship with them. A great relationship with the next person begins when YOU have clarity on what you will like to offer or/and get from them. 1 3. ORIGINALITY: To effectively connect with people, you must be a genuine person. No one wants a fake. Be yourself when meeting people. Human beings can easily tell a "wanna be" from a "genuine". 4. OPENNESS: Networking requires openness. You must be willing to share your knowledge, resource, contact and time with the people you try to connect with. Some people are in the habit of hoarding their contacts/connections while using yours to climb their way up. I find that "demonic"(permit me to say). I totally don't understand why you would depend on my referrals with my contact/connection to move up and will apply "scrap sense" when I need yours. Have you met such people? 1. CONFIDENCE: As simple as this sound, confidence isn't easy especially when your mind tells you that the other person is better than you. I need you to know that no one is #better than you are. They are simply #ahead of you. How about that ? One way to build confidence in approaching or connecting with people , is to first decide on what you will offer them. So before making that move, identify your skills, resources, existing connections and figure out how you can help them. I met Rev'd Mrs Funke Felix-Adejumo in 2012. I heard about her from my mum who always sang her praise and bring back her sermons from an annual event (Feast of Esther) organized by Mummy G.O of the Redeemed church for Pastors wives and female head of ministries. So in 2012, mum and I attended. That year as usual, Iya mi (as her call her) was speaking. We had a tea break and my mum said "that's Rev. Funke over there. Go and connect with her. I walked to her, knelt down and greeted. She was warm and nice. I felt relaxed.Then I narrated how my mum had talked about her and how I had listened to her teachings. I already told her my name at first, and then she asked "what do you do princess"? I told her (I will teach us how to effectively talk about what we do later in this lesson). She gave me her contact (email and personal phone) and told me the easiest way to reach her. I knew that was unusual and thought she may have sincerely picked interest in me to have done that. That year, I was posted to serve in Ekiti state. Iya mi lives in Akure in Ondo state, Nigeria. I pulled my friend serving in Akure to Agape Christian Ministries ,the church Rev. Funke pastors and I encouraged my friend to serve wholeheartedly. My friend did. I used to travel from Ado to Akure for Iya mi's event and I never went empty handed. I always got her a gift no matter how little. She couldn't recall my face at this point. I never minded.I served in a branch of her church at Ekiti where I was based and I was just enjoying the Lord in there. I kept on serving from a distance and never wrote nor called her throughout my service year. After my service year (one year after we met), I sent her an email in which I recalled how we met and how she had blessed me while I served from a distance.We got talking frequently, with me being the one to reach out most of the time. I would genuinely ask about her, pray for her secretly and via emails and often asked how I could be of help. A couple of years later she wrote me and many others she's connected to when she was about to begin #WomenOnTheWinningEdge in 2015. I jumped at it, got on the volunteer team and walked my all into that conference. I invited people, I spent my kobo, I gave my time, and I prayed for Iya mi, I was all out to help. It was in service that she got to match my name to my face. Before then, she only knew my name. Today, she mentors me. In fact, she paid some of the mentoring fee for me. That mayn’t have been possible if we didn't have a relationship. What is my point? No matter where you are, you have something to offer. I didn't have millions to credit her account .I didn't have access to the presidents of the world to connect her with. I had my genuine love for God and her, in addition to readiness to serve and I gave that. Today, I'm enjoying a relationship with her that is helping me fulfill purpose. It all began with confidence to meet/approach and GIVE not meet and TAKE or RAKE some people do. 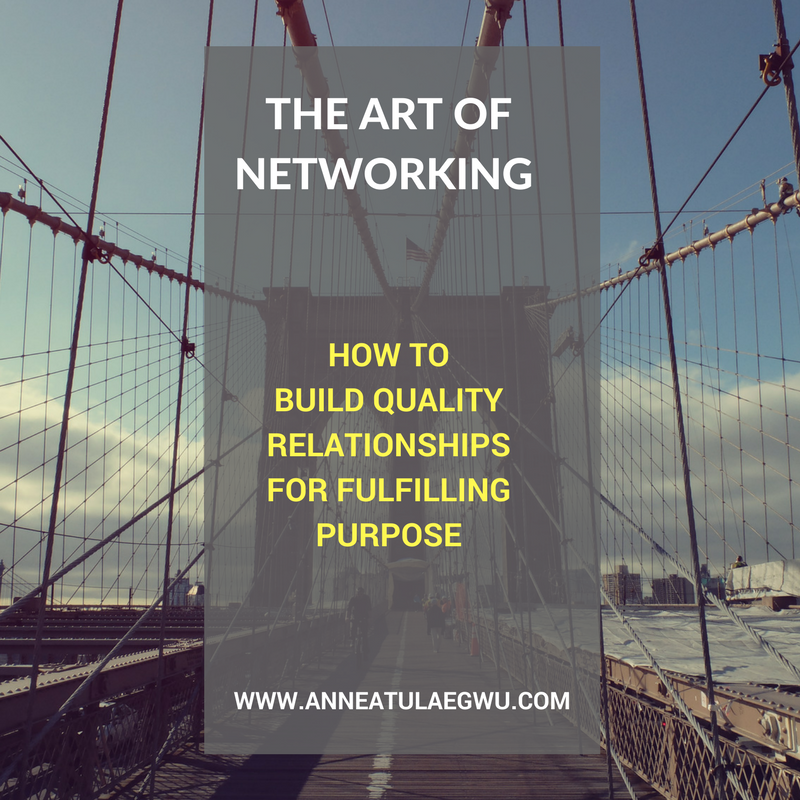 What do you have to offer those you want to connect with? Identify it and you will feel confident enough to approach them. 2. CHEERFULNESS: I don't know about you, but I don't like hanging around people who constantly look sad. Please be cheerful when you meet or attempt to connect with people. Smile genuinely and help them see that you enjoy their presence (even if you don't, in that case you can't "network" with them. Bottom line is "appear happy" please. Be it in person, via email, via text, over the phone, be cheerful. 3. ATTENTIVENESS: Pay attention to what people tell you. Personally, I don't remember names or dates easily but I never forget faces (blame that on my sanguine personality). Therefore I try to associate name with something so I can remember. I sometimes write it down. If I forget someone's name is never because I wanted to. They either didn't make a lasting impression on me or something. Therefore, when I'm interested in connecting with someone , I pay attention to the detail they share with me. 4. PROACTIVITY: If you want to build quality relationships, then you must anticipate their needs and have a ready solution to offer them. Never, begin building a relationship with requests. It makes you appear like a gold digger. Genuinely offer help the first time and consistently too. I'm not teaching on partnership with collaboration. That's different ball game entirely. However, the best partnerships/collaborations are between the people or group of people that have successfully built some level of relationship and trust. So please practice being proactive when you connect with people. Hey! 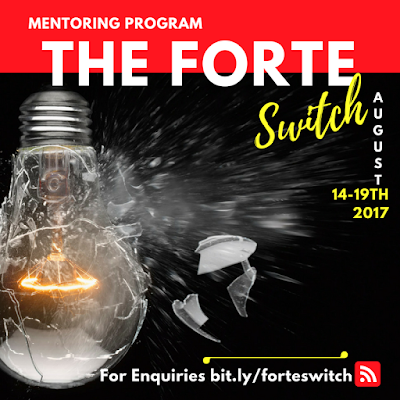 Join me at The Forte Switch Mentoring program scheduled for August 14th-19th, 2017. All of these processes are an effective blend of #coaching, #training, and #mentoring practices finely combined to bring you to a place of clarity, effectiveness and ultimate fulfilment.